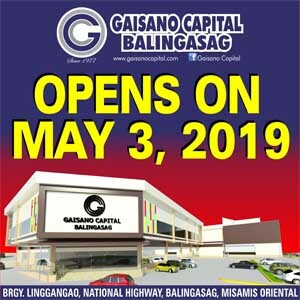 GAISANO CAPITAL BALINGASAG opens on MAY 3, 2019. You can get a wide variety of items from the Department Store and Supermarket at a budget-friendly price. Food and refreshment kiosks are also available. See you there as exciting giveaways awaits our lucky shoppers! 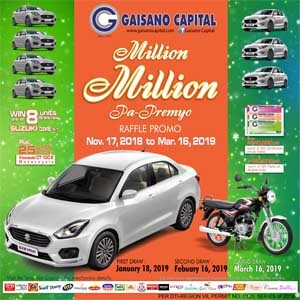 Buy More and Spend Less at Gaisano Capital. We are OPENING SOON in Balingasag! Location: National Highway, Brgy. Linggangao, Balingasag, Misamis Oriental (beside Balingasag Bus Terminal). Now open for Lease Inquiries. Get a raffle coupon for every single or accumulated receipt, cash or credit purchase worth P300.00 at the Department store or Supermarket. You can get additional one (1) raffle coupon for every purchase worth P50.00 from any sponsored products. Promo starts from November 17, 2018 until March 16, 2019. **See store posters for more details. 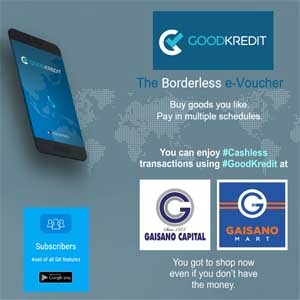 Enjoy a convenient and cashless payment when you shop at Gaisano Capital stores nationwide using GoodKredit App on your phone. GoodKredit is also accepted at all GMART stores. **Download GoodKredit App now at Google Play. 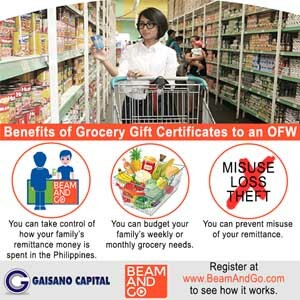 Gamit ang Gaisano Capital Grocery Gift Certificates, sigurado na sa basic needs ng pamilya maibibili ang ‘yong padala! Alamin kung paano sa www.BeamAndGo.com!